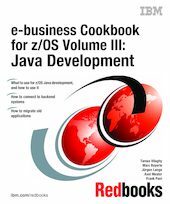 This IBM Redbooks publication is the third volume of a series entitled e-business Cookbook for z/OS. It is intended for Application Developers and Application Development Infrastructure Specialists who need to develop Web applications for z/OS using Java. The book focuses on the most popular and viable application topologies. It includes applications that use WebSphere V4.0.1: The use of IBM VisualAge for Java, Enterprise Edition, and IBM WebSphere Studio is key throughout. The book guides you through setting up the required development infrastructure. It shows how to develop various types of Web applications specifically for z/OS, and also how to use Java from batch applications and how to access VSAM data sets with Java. It provides examples for Web-enabling DB2 and MQSeries, and detailed information regarding connecting to CICS and IMS. The other two volumes in this series are e-business Cookbook for z/OS Volume I: Technology Introduction, SG24-5664 and e-business Cookbook for z/OS Volume II: Infrastructure, SG24-5981. Chapter 9. Migrating from WebSphere V3.5 SE to WebSphere V4.0.1.